This plugin is somewhat of like a stripped down version of ExposurePlot, but without the coolness, except that this plugin integrates with your Lightroom catalog, which is sort of cool. Focal Length — the focal lengths used, expressed in “35mm equivalent” terms so that data can be compared and contrasted reasonably among different cameras with different crop factors. 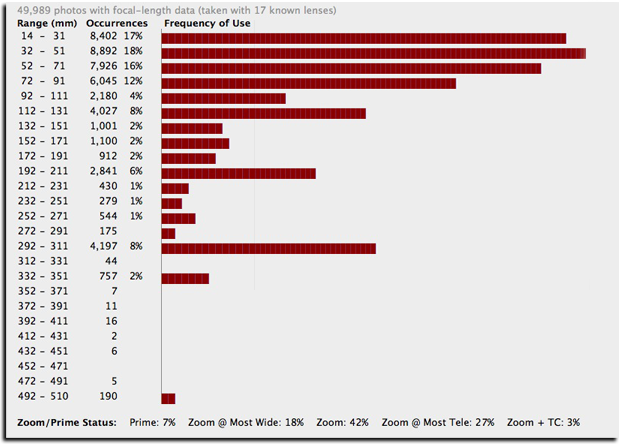 Extra data about the use of primes vs. zooms is also shown. Ev — exposure value adjusted for ISO sensitivity as well. In Lr3+, any develop exposure adjustment is also taken into account. To view a plot, select some images in the Library Module and invoke the desired plot via the “File > Plugin Extras > ...” menu. Tip: to work with all photos shown in the grid or filmstrip, select none and the plugin will automatically work with all of them. This is the same as selecting all except that selecting all suffers the side effect that Lightroom tries to compute an updated metadata display, a resource-intensive operation that can be easily avoided in this case. You can save the plot data to a CSV file. In Lr3+, you have the plugin create a collection of images that are represented by a row in the plot, to isolate them for further inspection. For a focal-length plot, you can have the number reported in terms of a different kind of crop factor. This is useful, for example, when considering lens recommendations for someone with a different kind of camera. Added a bunch more Fujifilm cameras to the crop-factor database. 20150728.86 Had the wrong data in the crop-factor database for the Fuji X100s. Fixed that, and added some other recent Fuji cameras. 20141019.79 Windows Only: Add a one-time check for the POODLE security vulnerability, and alert the user if it exists. 20140710.71 Sigh, had a bug in the Creative-Cloud support. 20140704.69 Sigh, introduced an error for some folks with the rebuild the other day. Fix a dialog-display bug in Windows. 20140311.65 Wow, I'd really screwed up the calculations for the "Total Exposure (camera Ev)" and "Total Effective Exposure (effective camera Ev)" items. In both cases I had the sense of adjustment for ISO speed backwards, and in the latter case I had the sense of adjustment for the Lightroom develop setting backwards, and in some cases could use the wrong number to begin with. Doh! 20131014.64 Found that with certain settings some math errors would pop up. 20130925.62 Updated the camera crop factor database. 20130910.61 Added a bunch of cameras to the crop-factor database. 20130830.60 Added a few more cameras to the crop-factor database. 20130613.57 Better support for plugin revalidation. 20130524.53 Apparently, a recent change broke things on Lr2, which some folks apparently still use. 20130330.50 Added some Ricoh cameras to the crop-factor database. 20130328.49 Fix for the registration system. 20130311.48 The Ev calculation was wrong. 20130124.44 Added a bunch of Canon cameras to the crop-factor database. 20120608.43 Fix an "attempt to perform arithmetic on field" error. 20120428.41 Added another Canon camera. 20120325.38 Added a bunch of Canon compacts to the database, and fixed a few that had been incorrect. 20120313.37 Added a camera to the database. 20120312.36 Added some more cameras to the database. 20120309.35 Had broken registrations in Lr2; Update to the debug logging to better track down timing issues that might arise. Added the ability to save the raw data to a CSV file, in addition to the ability to save the summary data that was already there. Added a few more cameras to the crop-factor database. Fixed the data saved to the CSV file for ISO and shutter speed; it had been saving the log of the actual value instead of the actual value. 20120131.31 The plugin was neglecting to report when images had a focal length encoded in the metadata, but couldn't be plotted because the plugin couldn't figure out the 35mm-equivalent. In these situations now the plugin is clear about what's happening. I also added a bunch of crop-factor data for recent Fujifilm cameras. Added some extra debug logging to try to track down an issue. Fixed a bug that at times caused the focal-length labels to be incorrect, citing a random lens within the actual range as one of the endpoints of the range. 20110908.24 A few updates to the internal crop-factor database. 20110822.23 Had an issue in the previous update with photos getting dropped. Rewrote all the internals, and in addition to the ability to plot focal lengths, you can now plot apertures, shutter speeds, ISO values, and Ev. In Lr3 and later, Ev includes any adjustments made to the "Exposure" slider in Develop mode. 20110628.21 Updated the internal crop-factor database for the Fuji X100, which doesn't seem to include its crop factor in its metadata. 20100829.20 Made the revalidation process much simpler, doing away with the silly need for a revalidation file. 20100822.19 Assume any camera-model Exif with 'scan' in it is from a film/slide scanner, and treat as a full-frame size. 20100820.18 Discovered a bug in my plugin build system that caused horribly difficult-to-track-down errors in one plugin, so am pushing out rebuilt versions of all plugins just in case. Added code to allow plugin revalidation after having been locked due to a bad Lightroom serial number. 20100625.16 Yikes, shaking out some more build issues. 20100624.15 Discovered a nasty build bug; pushing a new version in case it affects this plugin. 20100624.14 Oops, some of the new Lr3 collection stuff wasn't working... should be now. 20100516.11 Update for the Lr3 beta. 20100315.10 Wholesale changes that attempt to honor the user's locale settings for numeric display (e.g. Europeans writing 3,14156 for pi). I've probably missed some spots, so let me know if you find some. 20100312.9 A few more UI tweaks. Minor UI tweaks on Mac. 20091205.7 Minor internal debugging tweaks. 20091022.6 Added a bunch of standard sensor sizes to the "view in terms of" list, so you're not limited to the view of just the cameras you already have. 20091022.5 Added the ability to save the raw data to a CSV file, and the ability in the dialog to view the focal lengths in terms of any of the cameras used. 20091022.4 Added a first draft of some rudimentary support for Lightroom 3 Beta. See this important note about plugin support in Lightroom 3 Beta and Lightroom 3, including future plans for features and my registration system. 20091018.3 Doubled the size of the crop-factor database thanks to a library of images provided by exiftool author Phil Harvey. 20091017.2 Well, I didn't realize that some camera makers (e.g. Canon) don't populate the FocalLengthIn35mmFilm metadata item, so I built a database of camera crop factors (currently: 678 cameras) to compute the 35mm- equiv focal length myself. I really like it – just tried it out today. Thanks for stuff like this. Interesting looking plugin. I used ImageReporter which runs separate from Lightroom. The ability to use a csv file would provide those whose like this kind of stuff to play with it the best. IR doesn’t do cvs. It does report to the nearest 10mm which makes for nicer plots. This has come in handy for looking at what lenses to buy after using a “vacation” zoom (18-200). The one major sticking point is reporting in equivalent focal length. This is misleading and in the case of using the data to help with lens purchase – useless. I shoot both film and digital cameras using the same lenses. A 100mm lens produces the same perspective and distance compression on a crop sensor or 8×10 negative. This e-focal crap has to die… sorry, bit of a sore spot. Maybe an option to use either equiv or reported would be a solution? And for some reason LR thinks I have 3 different cameras with the same make, model, and serial number. Enjoy the plugins, great work! Thank you for making available these great Lightroom plugins. 1. Focal length is logarithmic in question – in your diagram above, the 20mm range between 14 and 31mm range is far more vast than the 492-510mm range at the other extreme, in terms of look. I suggest the scale should be logarithmic – between 7 and 20mm (35mm equiv f.l.) each range on the chart should probably be no more than 1mm, whereas at the other extreme (above 400 mm) it can be as much as 50 or 100mm. – Which focal lengths and apertures are associated with my best rated shots? – Which focal lengths and apertures am I using most often? – Which lenses can I do without? – Which lenses produce the most shots I reject? Thanks. I was looking for something like that worked with the LR library just a few weeks ago. If you could find the time I think it would be great to have graphs for ISO and other exposure info too. Thanks for another great plugin. Using this in combination with built in LR filters really helps me understand which lenses produce the most pleasing shots. I have been playing with Data Plot and graphing with Excel. It has shown me some interesting things about lens use. Makes one wonder why I bought some of them…. I always like a neat program… keep up the good work. Thanks. I first tried doing a “Screen Print”, but all I got was the background of LR2, not the Data Plot (it’s really labeled “Jeffrey’s Focal-Lenght Plot”). Not sure why this happens. Press Print SCRN and the Data Plot panel vanishes, “click”, the screen print happens, the data plot comes back on top. What gets saved is the LR2 panel. I do the Data Plot then do a Save Data to generate the CSVs. Then on to Excel (since I could not print screen it). First thing I had to do was delete the blank lines after I opened the CSV in Excel (2000). Would be nice if the blank lines were not there. Then I converted the StartMM and EndMM to the normal lens values. Just divided the values by 1.5 because the output of Save Data converts (or uses) 35mm equivelent. Know you are working on this. Great if it was the same choices as on the screen plot. Then I created a new column of data that was a Range in mm, using the StartMM and EndMM converted data. Just like on the Data Plot. Would be nice if you had a column in the CSV giving range. I would like to see nice rounded values in the StartMM EndMM and RangeMM areas. Values in multiples of 5, 10, 25, etc. Nice round numbers. Currently you might have a value of 189 or 193. How about these falling in a 185-200 range. I had lots of odd ball numbers on my plots. This would be a “Nice to Have” but most likely is a “Easier Said Than Done” item. Thanks again for neat programs. Not to mention a neat website. I’m triing out your data-plot plugin but when I check my Panasonic FZ30 pictures I see in the dropdown more than 1 entry for the FZ30 with different crop factors (4,9 – 5 – 5,1 – 7,5). Now you can choose a lower resolution where the FZ30 only uses the center of the sensor and so seems to have a bigger cropfactor but that is in reality only a crop of the bigger picture so (in my opinion) nothing to use in your calculations. You say you use a database of camera’s to calculate the 35mm equivalent but I suppose that it is buildin the plugin and that the user has no acces to it to add/remove entries? Hi ! Congrats on your program ! Just one question: does it also works with RAW anf TIF files, or only with JPG (like ExposurePlot) ? This is a great “self-awareness” tool. A terrific adjunct would be a similar plot of orientation (ie, vertical/portrait, horizontal/landscape, square)! Unfortunately the current version does not know my Canon EOS 60D with crop-factor 1.6. Is it possible to add this camera to the database? Thanks, for this greate Plugin and the further development. Any information you need to add this camera to your crop table? Tried with lightroom 4, using newest version available. Data plot didn’t include all focal lengths, for example, it give data from 14-24, skips to 28-30, skips again from 42-43, again to 56-67, etc. About a quarter of shots were from a 50mm prime on full frame, so there are photos taken with the lengths not included. I’ve just used Data Plot for the first time….very interesting (focal length) results for me. Thank You. Thanks for your swift reply. There’s no ‘OK’ button on my window but the Enter/Return button worked just fine. Any idea what could be going on? Maybe it’s because I’m choosing RAW images? I find this plugin quite interesting and informative. Although Lightroom itself shows the focal length, for example, at which a photograph was taken, I find it useful to obtain the data for a whole collection of photographs. However, the data from the plugin do not always correspond with those shown in lightroom. For example, for a few photographs the plugin indicates a focal length that I do not even have available. Would you know why this is the case? I stumbled across your site this morning and I’m impressed with your work. The utility plugins “Bulk Develop Settings” and “Folder Status” are exactly what I’m looking for. Anyway I tried the data plot out and I got a kick back message saying “… plugin doesn’t know how to calculate the 35mm-equivalent focal length of images taken with the Canon EOS 6D …” I’m sure its related to the fact that the camera is recently released and you haven’t had a chance to update. Just thought I would let you know. Keep up the good work! Just wanted to say “Thank You!” for this utility, it was exactly what I needed! And by the way I still have a copy of your remarkable regex book on my office shelf. I tried this plugin to plot focal lengths over my collection. Unfortunatly, my Camera (Canon 650D) doesn’t appear to be supported. Why is that? Can’t you make the 35mm-equivalent calculation optional? Usually I’m aware of the camera used to take my shots, and I would rather get the raw focal length as it is noted in the EXIF instead of some processed value that may or may not be correct. Thank you for the inclusion of the Canon 650D! The plugin is now working perfectly fine for me. What I was getting at was this: How about making the focal length given in the EXIF the display-default? If there is an additional 35-equivalent number in the file, or the camera modal is “known”, the processed/calculated focal length could still be used, but if the raw data would be the default the plugin wouldn’t fail for every new camera that comes along. For example, while my Canon 650D is now supported, and my Powershot S70 and S90 apparently already had been, every once in a while a shot from a smartphone camera or another person using a totally different camera sneaks in. Each time, the problem comes up again. The first group contains 80% of all shots, but I can’t split it any further. The first two groups make up a lens (16-35mm), which I’d like to brake down further. The only way currently seems to be to select different images/folders for analysis – which to me kind of defeats the purpose. Of course, I understand the complexities – the algorithm has to cover the full range, and it can’t very well know where to “spread” and where to “narrow”. -> this gives all the shots in the first two groups (and only those) in the DataPlot-collection. But it’s slow, and it only works becaus e per coincidence the first two groups exactly comprise the particular lens. An idea that would work for me whould be this: Next to the triangle, introduce a control that will split this particular group in two new ones. That way, if one wants to go down into details, he is only limited by window size – which can be expanded or scrolled manually. And the algorithm that chooses the groups in the first place would not need to be modified. This plugin looks very useful, but I think it might be even more useful if you could also plot some information from the develop settings. I think this could help show us what kinds of persistent problems we have when we’re shooting that we might not be fully aware of. For example, including statistics for the amount that we adjust the exposure slider could let us know if we tend to over or underexpose our images. If my stats show a spike at +1 EV but very little in the negative range, I could learn from that and start making a habit of increasing my exposure a bit while shooting. Another example I think that could be helpful would be in the white balance. If I’m constantly warming my photos up by a certain amount, I can just start making the adjustment in camera (or with a default preset). And if you really felt like going all out, the plugin could also categorize it by general lighting conditions (e.g., daylight might be spot on, but in indoor settings where the color temp is closer to tungsten, I might always increase the temp by 400 Kelvin and slide the tint to magenta by 3 points). Last though: including info for the other sliders could help show us what adjustments we tend to make all the time so we could design default adjustment presets based on the adjustments from our most used settings. Thanks again for making all of these wonderful plugins! Hope you were able to find some turkey sushi to celebrate yesterday! For an upcoming workshop I’m teaching, I’m trying to get people to use Lightroom to analyze their lens usage patterns in both absolute numbers, as well as related to results (ie, “great” shots). In doing so, I’m trying to create Excel data to allow various analysis of Lens vs. Focal Length Used vs. 5 star images. Ditto for % portrait vs landscape vs square for 1 to 5 star images, based on focal length and lens. and under Lightroom 4.4 OS X, it’s still hanging when i run it against my main catalog. Is there a memory leak? (see 60GB+ virtual memory, but plenty of physical memory and plenty 700GB+ of startup hard disk space). I’ve tried arbitrary selecting fewer (eg, 200K) but it stills shows 100% complete, with net fewer images than the total. I’ll email you directly to I include the screenshot. After I run the plug-in, the plot graph does not show up. I go to file>plug-in extras> calculate focal length sort. It calculates the images that I selected but then I do not see the graph. Am I missing a step? I am running Mac. Ah, okay. Thank you! I’ll also do that plug-in as well. Just noticed that Canon 5D Mark IV shows up with a crop factor of 1.2x. It would be great, if you could change it to full frame. I thought it was correct in a previous version, but not 100% sure. Please continue to develop plug-ins, although I will stay at Lightroom 6 as long as I can and move to an alternative program as I don’t like Adobe’s abo model.